In all this pseudo-prophet worship, I've still not read a single word where they (or the man they are lauding) ever claim to have seen God, spoken with him, and where they are delivering the words he gave them directly. Color me unimpressed. I also don't find General Conference instructive and rather poorly done. I've long since stopped listening to it and read the talks now. I mostly despise the heavy reliance on teleprompters and the nasal way they present their talks. The cadence is irritating. There is a world of difference between how they speak now to how General Conference talks were delivered before the introduction of the teleprompters and ghost-writers. Back then they had to prepare their own talks, memorize the material, and learn to give a proper public address. There are a few examples online that you can listen to. I appreciate all the research you put into to write this post. Thank you for taking the time to share it with us. I agree Sunday morning was such a blatant example of idol worship. Interesting fact about President Packer. Something to keep an eye on. I wonder if any of them have met with the Savior. I would love to know either a yes or no from each. Also, is it possible to visit with Christ and still have, what seems to be, such fundamental unveils? I wonder if there is scriptural examples of that. Are you sure it was 1984 GC? I've looked at David B. Haight's April and October talks from that year and can find no mention of a heavenly visit. It was, in fact, October 1989 GC, "The Sacrament--and the Sacrifice"
That talk is still a breath of fresh air almost 30 years later. Adrian, Robert D. Hales followed those three speakers on Sunday morning. His eloquence in speaking of Christ was instructive and illuminating; in stark contrast to the "hero worship" of the "living prophet". Although he does end in an aside to the "prophet". Following Robert Hales was fairly newcomer James Hamula who spoke of the sacrament. A careful in conference course correction? Really????... Is this just an excuse for why God doesn't seem to approve of you? They don't prophesy, they don't reveal, and they produce no acts of seership. Where is the fruit? Would those be the same scriptures that say this? It seems very clear to me. If miracles aren't being wrought in your life and if ANGELS aren't visiting you, then you do not have faith and you are damned and you are as if there was no redemption made. As hard as this is for me to take in my current condition, I accept it. I believe it straight up. So yes, we DO NEED ANGELS to visit us! Why don't we believe these things? I gave a testimony in my ward on this and I got looks like I was an alien life form from the Deneb solar system or maybe my tie was crooked. These idolatrous men do not have the power of salvation. In the day of calamity these idols won't be able to save you. They won't even be able to save themselves. "Our sustaining is an oath-like indication...". Really?????????? Thanks for letting me know to NEVER raise my hand to sustain you again. I swear NO OATH to ANY man. I bow down before my Lord Jesus Christ and worship HIM alone with all my might, mind, strength and my whole soul. He is the keeper of the gate and He employeth no servant there. Good for you Gary. Thanks for sharing from your heart and for not fearing what men can do. It's so sad that so many feel the need to be anonymous (trust me I'm not being critical of those who do) for the obvious reasons. I wonder who's reading, who's taking down names, who's contacting local leaders, etc. Strange time in the church indeed where those trying to follow the Book of Mormon are being chased away. Sustaining leaders does not mean closing our eyes when they deviate from true doctrine and from the restoration. Just the opposite I think. Do you sustain your child by letting them trash your house or car? Is it true love and concern to simply give them a free pass? Questioning what they are doing with the Lords money is not apostasy. It's called sustaining them in their stewardship. Thank you for saying what is in my own heart, Gary. It is frightening that these men believe THEY are the means of our salvation. A note from my journal concerning Stake Conference last Sunday: A counselor in the Stake Presidency spoke of hearkening to the voice of the Lord, trusting the Lord, confirming pure doctrine by the Holy Ghost, unfolding the mysteries of God, and not putting our trust in man. The only problem being that he likened all of these to following the prophet. It is sad that the doublespeak is not apparent to those who preach such things and to those who lap up the damnable doctrine that following a man is following the Lord. 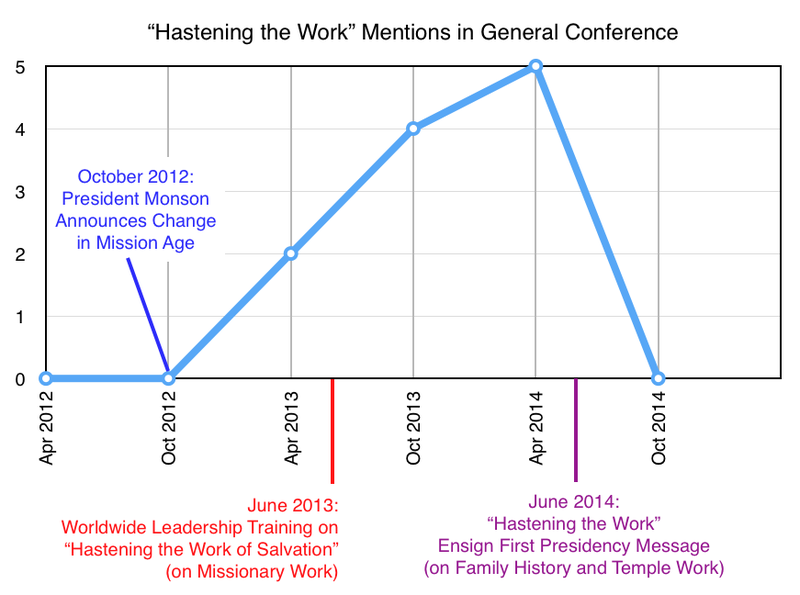 Now that the mantra, "hastening the work" has gone out of style I wonder if they will go back to the old one, "to the rescue." Only this time it's to rescue the institution from total collapse. I wonder if the abrupt stop was in response to Denver preaching that there is no hastening the work. The incredible emphasis on following the prophet seems to be a response to the truth that Denver is a true messenger from heaven, and they are not - and a reaction to the fact that the Lord has taken His priesthood away from the general authorities (or church in general). They seem to be running scared: "What if Denver is right? He CAN'T be right. WE hold the keys not some apostate upstart. Still, we have to defend ourselves and the church. People might believe him. We will lose power and tithing dollars if we do nothing." They may even genuinely feel that souls will be lost if people listen to what the Lord has been saying through Denver. Surely, it is a turning of things upside down. Surely, there is a strange thing among us. Surely, there is a wild man among us. My wife and I were just talking the other day about the strong messages about following the prophet and staying on the church 'ship'. I was almost tempted to think that with all of the people in the church talking about their slight dissolution of the leadership, that the conference talks were aimed to counter this type of thought. I do feel very strongly, like others seem to as well, that the link between my Father and I, needs to be the focus of my spiritual development rather than man. I do find that following/reporting to church leadership at a local level does have its place in helping to keep me humble though. Especially when I don't agree with what is being said to me. This Hastening Past the Hastening makes me think of how coincidental it was that Saddam Hussein got 100% of the vote in a "free democratic election." Great piece, thank you Adrian! It seems from internet traffic that Elder Bednar has announced at at least two stake conferences that the church will be moving away from building traditional chapels to free up funds to build more temples in the 3rd world. I'm not sure what the next slogan will be, but be prepared for this to be one aspect of it. It will be temple-centric. Maybe they will just shift hastening the work to be hastening the temple work. The truth is, as Bednar explained, there is no money to build traditional chapels in the 3rd world, as they would have a very long payoff period due to the finances and lack of paying tithing of the developing world members. But a temple district can cover a million members and, even in the 3rd world, pay itself off in a year due to the cheaper models they use in the 3rd world compared to, say, Utah. We are watching the death throes of the church. I think city creek and the other real estate ventures are a desperate reaction to the sacking of the treasury in 2008 due to the stock market crash. They see the declines in tithing and are thrashing for a replacement for revenue. The city creek project is an abysmal failure (many or most condos are unsold), Ensign Peak is not the money maker it once was, and they are struggling bigtime to come up with a way to finance the church moving forward. The answer: Build temples in the 3rd world. The two reasons they have purposefully inhibited missionary work in the 3rd world is because they can't afford the meetinghouses or the welfare in those areas. The meetinghouses cost far more than the welfare budgets, and they've been able to get along fine without giving (hardly) any welfare in the 3rd world thus far by pounding the self-sufficiency drum. In other words, they only give away whatever fast offerings are collected in those areas---there is hardly ever any supplement from SLC. So it's still a net gain. This is a much more pernicious picture of "building up churches to get gain" than painted at Bare Record currently. Watch it come to pass. I think you are correct. Declines in the size and quality of church buildings are happening here in the US. I live in an affluent growing area of the Southeastern US. Two stakes share the same stake center. The two recently built meeting houses have tiny kitchens, and 1/2 gyms. So small, are these buildings, that ward parties have to be held only in the warmer months because the buildings are too small for ward parties. The new stake center being built is too small for stake meetings, also with a 1/2 gym; so the old stake center will be used for stake conference for both stakes. Even the 25 year old building is not big enough as stake conference consists of two sessions of the Sunday meeting to accommodate the Stake. About three years ago the wife of long time stake leader told me, "they aren't building local buildings like they used to". At the time, I pooh poohed it, but now I think it is right. I don't think the LDS Church is going to up and die any time soon. Now, the current version of it might because it is built on tithing revenue and I really don't think that is going to be increasing very much if at all. However, don't forget that for many decades the LDS Church was in debt and has a pattern of making large financial mistakes. What I see as likely is the LDS Church won't grow very much and may dwindle somewhat over the next few decades because of this focus on not building meeting halls and building temples instead. I'm not really concerned about that and would be delighted if it disappeared altogether actually (though I highly doubt that will ever happen). What I'm hoping will happen is that members of the Church will step up and either seek to reform it (I attend from time-to-time to see if that is possible), or again seek the Lord and find out from him what he'd like them to do. In any event, if one seeks to follow the Lord and does as he asks, then you will be fine. There will be several shots of life saving medication before death. 1. The sanctity and sacredness of the three hour block will be violated. Look for SS to bite the dust and the last vestiges of any study of the scriptures. With a two hour block you can put four, five or maybe six wards in a building rather than three. 2. Force members to drive to the buildings in the old parts of town where there are currently one or two wards. In Boise, there is a lot of Mormon flight to Meridian. In my stake there are four buildings each with two wards. 3. The pleas for more fast offering money is interesting. It is coming at the general level and the local level. You're kinda stuck at that 10% for tithing. Hmmm... I wonder how much more there would be if we didn't build buildings and just met in homes or parks? I wonder if that is being tried somewhere? I find it interesting that Pres. Monson said we were "15 Million strong" in his first address in Oct. conference. I wonder if they take into account those who's memberships have been taken off the rolls? If they do... then baptisms must be "way up" to compensate for the fall out. If the City Creek mall is not doing well and they have not sold condos.... why are they following the same pattern in Philadelphia? I find that odd. I also find it odd, if finances are tight for chapels, why are they building such a large and extravagant temple, large grounds and visitor's center in Italy. The cost of the statues of the apostles for the visitors center must have been huge. Competing with the Vatican? A year of so ago, it was brought to my attention that President Monson has never testified in behalf of the legitimacy of the Book of Mormon. I wonder if that is true. I did go back and look at look at his recent talks and there is no testimony of that book. In fact, many current messages from the brethren contradict many of the messages of the BOM as suggested in Gary Gibson's comments concerning Moroni 7. I was impressed by the talk on the Sacrament and the Atonement given by Elder James J. Hamula. No fluff, no stories... just sound doctrine. Thank you Elder. Although it may be interesting to speculate.... whatever the difficulties the brethren are having in managing the affairs of the Church, they must feel the weight of their responsibilities every day. I will continue to pray for them and do my best to serve where I can. I have my own affairs to contend with, both physically and spiritually. Preparing myself to be worthy of Zion, whether I live to see it or not, is enough to keep me busy without worrying about what Salt Lake is doing, even if appearances seem odd. I am reminded of the incredible devastation to be visited upon the world and that "in my house it begins, and from my house it goes forth... FIRST among those who have professed to know my name ('special witnesses') but have never known me." Time will certainly tell who has, and who has not known the Lord. No speculation needed. I just came across this blog today for the first time. I live in Nampa, ID. I don't know who you are. From the little I have read, It's unbelievable to me how you can claim to believe in the church but continue to criticize and condemn the church and it's leaders. This blog does indeed lead people to doubt and focuses on drumming up controversy rather than building or edifying. Don't pretend to be focused on your relationship with the Lord while causing others to doubt in His church. This is the church referred to in 1 Nephi 14. The Book of Mormon is true and if you believe that, you must believe the church is true. No other fulfills this prophecy. your entry about the church's excommunication powers being equivalent or even greater to death penalty all the while leading others to the same place spiritually is mind boggling. Humble yourself! Leave it alone and repent! Follow the counsel you've been given. Anon, I'm not even sure where to begin in responding to this. It would be nice if you addressed something specific you disagree with rather than engaging in vain repetitions. The Book of Mormon shows a pattern of fallible men who often led the church astray and needed to be called to repentance. There are a LOT of problems in the church these days. The church itself on its own website now attributes the past policy and doctrine to ban blacks from the priesthood to racism and regards it as having been uninspired. A lot of people in the church feel that there is an excessive focus on leaders rather than Christ. You talk about drumming up controversy, I feel like that's what many of these talks in conference promoted. It is a false doctrine that the leaders of the church are prophet and can't lead the people astray. To conclude that the Church is "true" just because the Book of Mormon is true is a non sequitur. Perhaps even more harmful is the non sequitur that the Book of Mormon must be false if there are errors in the doctrines taught by the Church. I have many friends who no longer live the Gospel because of the problems they have found with the things the Church teaches, and it is sad that they have been unable to exercise enough critical thinking to separate the Gospel from the Church in their minds. We must build our foundation on the Rock, and the Church is not that rock--the Rock is much deeper than the Church. Whether the Church manages to build upon that Rock and stay on it is beyond our control, but salvation is an individual thing anyway, and the Lord will not leave us comfortless if we trust in Him. I'd like to further comment on the church spoken of in 1 Nephi 14. "Behold there are save two churches only; the one is the church of the Lamb of God and the other is the church of the devil; wherefore, whoso belongeth not to the church of the Lamb of God belongeth to that great church, which is the mother of abominations; and she is the whore of all the earth. I don't believe the angel guiding Nephi through his vision was speaking of "the church" as an institution. Whenever the scriptures mention the word church in a positive light, the LDS people believe the scriptures are speaking about the LDS church. A church as an organization rarely existed in Book of Mormon times. There were the believers and the non-believers. Yes, in Alma's time, there was actually a church, but it was certainly not a corporate institution akin to the present day LDS church. "And it came to pass that I Nephi beheld the power of the Lamb of God, that it descended upon the saints of the church of the Lamb, and upon the covenant people of the lord....and they were armed with righteousness and with the power of God in great glory." Do we even know what it means to be armed with righteousness and with the power of God in great glory? I tend to think of Enoch and his city. "And so great was the faith of Enoch that he led the people of God and their enemies came to battle against them, and he spake the word of the Lord and the earth trembled and the mountains fled and even according to his command; and the rivers of water were turned out of their course and the roar of the lions was heard out of the wilderness; and all nations feared greatly, so powerful was the word of Enoch and so great was the power of the language which God had given him." I believe that this is a description of being "armed with righteousness and great glory." D&C 76 describes the church of the firstborn as "they who dwell in his presence;and they see as they are seen, and know as they are known, having received of his fulness and of his grace." These are the people who have stood in the presence of God the Father and Jesus Christ. And yes, this may happen in this life, not after we die. Then we are assured of our standing before God, and he covenants with us personally, and then we are truly his covenant people. This is why the numbers of the church of the Lamb of God are few. It takes much greater faith and sacrifice to actually be a member of the church of the Lamb of God, then to be a member of an earthly organized institution. It takes giving your life and sacrificing all to the Lord, and then receiving power and glory from Him. Then you may be counted as part of his church, and you may not even be a current member of the LDS church. I MUST believe the church is true if the Book of Mormon is true. Them is some pretty strong fighten words. Which Church are you talking about? The one in D&C 10:67 or the Great and Spacious buildings down town SLC? Adrian, I agree with you, but worth pointing out, this was just three talks. Over on BCC they have a Wordle for the whole conference which apparently shows Jesus/Christ to be the most focused on things. These particular talks did bother me. In my opinion not even a single talk should promote leader worship. But I don't want to be biased an act like this represents all of conference either. I guess my point is that Wordle's by themselves, while interesting, can be a little misleading. I actually had the misfortune of only listening to the two Sunday sessions. So to me just from those sessions it felt like an excessive focus on leaders. But in the context of the whole conference, was it? Maybe not. I hear there were some great talks in other sessions. I think what might be interesting is to create a Wordle for each talk individually, and then take the 5 most popular words from each talk to create a "talk theme," and then create a separate Wordle which compares the themes from each talk and see how things land. Since every conference talk ends with the reflexive use of some flavor of "in the name of Jesus Christ" that will obviously add another 38 uses of "Jesus Christ" without actually meaning or teaching anything. I believe those beef up the word cloud quite a bit. When you read the method used in the BCC word cloud, these meaningless uses were not removed. I wonder what the word cloud would look like if they were. I am curious to know which sessions of general conference have the greatest ratings. I wonder what the impact of a word cloud would be against the ratings. Having been at one time employed by the church and having written software for the General Authority portfolio, some specific to the production of General Conference. What I know is how speakers are organized for conference with emphasis on Sunday particularly the first session. So although the word cloud provided by Adrian is skewed, it is not all that inaccurate in terms of impact. Anonymous who wrote "This is the church referred to in 1 Nephi 14. The Book of Mormon is true and if you believe that, you must believe the church is true,"
I'm afraid the phrase "the church is true" doesn't even make sense. "The church" isn't "true" anymore than it's "false." Neither statement makes any sense. A church is an entity, an organization, an institution. We would sound completely ridiculous if we were arguing about whether McDonalds, or the IRS, or the New York Stock Exchange were "true" or "false." The LDS Church, United States Government, Apple, Exxon Mobil, and Berkshire Hathaway all exist, and in that sense, are all "true." The Tooth Fairy, the Easter Bunny, Sandy Claws, etc. do not exist, and are all therefore "false." Now a church can possess truth, advocate truth, teach truth, etc. and it can likewise neglect truth, silence truth, or shun truth. To the extent the LDS church engages in the former, and not the latter (and there's still a great deal yet remaining), I celebrate that and join with them in teaching, testifying, and advocating truth. But doing that doesn't make "the church" "true" any more than it makes me "true." I've read 1 Nephi 14, and find only references to a "church of the Lamb of God" which describes people who are "armed with righteousness and with the power of God in great glory." I note that it does not say "some among them were armed..." or even that "most of them were armed..., with some bad actors that occasionally creep in to any church." It says the church of the Lamb, who were the saints of God, who were armed in that manner. It sounds to me like this church is composed entirely of those who are, in fact, saved souls. I like aspirations. I hope to be numbered among the church of the Lamb. I likewise hope to be among a people who the Lord can call "Zion." But I think it would be extremely foolish for me to take the name on myself and declare that I am "Zion" or that I am "the church of the Lamb" (or any number of other name-titles) prior to having the name bestowed by Him whose right it is. Before Genl Conf. I had been pondering some of the same issues mentioned in this post and in the comments' section. I have read Nephi's vision and the vision of Lehi and prayed over those scriptures lately in depth. Two things struck me: the church of the devil is "the whore of all the earth"…and what does a whore do? Dispenses her most intimate favors for money. Try going to the temple for "saving ordinances" without giving heavily of your money. The other thing I was impressed with was the concept of the church of the Lamb being very small, but consisting (according to Him whose church it is) of those who "repenteth and cometh unto me" and get this, He goes on to say: "Whosoever declareth more or less than this, the same is not of me, but is against me; therefore he is not of my church. "(D&C 10:67-68) Then whose church would those people who declare "more or less" belong to? I heard a lot of declaring more and less when I listened on Sunday morning. There were only a few who spoke of repenting or coming unto Him. There was a plethora of false doctrine spoken, especially the first 3 talks wh. were rich (saturated!) with admonitions to follow the prophet and to follow church leaders. Indeed, Elder Hales and esp. Elder Hamula were like a breath of fresh air in an otherwise stale and embarrassing parade of sycophants Sunday morning. One last thought: the LDS "church" is not the leaders, it is not the buildings, it is not the Gospel or the scriptures or the temples. The LDS "church" is the people who have been baptized and accept the Book of Mormon and accept Joseph Smith as a Prophet. Those acts do NOT constitute coming unto HIM as outlined by Nephi in 2 Nephi 31-32:6, wh. includes faith in Jesus Christ, repentance, baptism by water, baptism of Fire and the Holy Ghost, following the strait and narrow path, feasting on the words of Christ, and meeting Him "in the flesh". By definition, the LDS "church" cannot be the Church of the Lamb as mentioned by Nephi because that church is defined by the Savior Himself as those who repent and come unto HIM…nothing more and certainly nothing less. Therefore, the question arises, if the LDS "church" is not the Church of the Lamb, then whose church is it? Perhaps that is best explained in D&C 84:55-57 "wh. vanity and unbelief have brought the whole (LDS) church under condemnation. And this condemnation resteth upon the children of Zion, even all. And they shall remain under this condemnation until they repent and remember the new covenant even the Book of Mormon and the former commandments, wh. I have given them, not only to say, but to do according to that wh. I have written." In my wards sacrament meeting. Theme is hastening the work, so it seems that in some locales the slogan/program is alive and well. Adrian...what is the "real" reason behind this blog post, or even this entire blog itself? If you can't see it, I feel sorry for you. Though I appreciate your accusations, you're in no position to know my heart or the so-called "real" reason behind this blog. I am not angry. I am not seeking to contend with anyone. I am only seeking to teach truth. In that sense, I am contending against error and false tradition, and believe I'm in good company as I do so. I have tried for a number of years to get the minds of the Saints prepared to receive the things of God; but we frequently see some of them, after suffering all they have for the work of God, will fly to pieces like glass as soon as anything comes that is contrary to their traditions: they cannot stand the fire at all. How many will be able to abide a celestial law, and go through and receive their exaltation, I am unable to say, as many are called, but few are chosen. (Jan. 20, 1844.) DHC 6:183-185. Though I contend earnestly for truth, I’m not contending with anger. If the things I write make you uncomfortable or even angry, I hope you’ll explore the reasons why. As for your notion that I have a “real” reason for this blog that I’m somehow keeping “hidden” I’m afraid you’re just wrong. I’ve been very open about why I write and I’m telling the truth about it. There are also those who seem to think I enjoy this. I don’t. It’s difficult, time consuming, and brings me persecution and false accusations like yours. It is a sacrifice. You are reading TOO much into this. what i find odd is that the quotes you give of GC speakers that you say are mentioning the prophet are not quotes that mention the prophet. they mention the "President" of the church. So are there any speakers other than BKP that call Monson a prophet directly? In the vernacular of Mormonism, the President of the Church is the de-facto prophet. There is no difference between the two in common usage, and in general conference references. 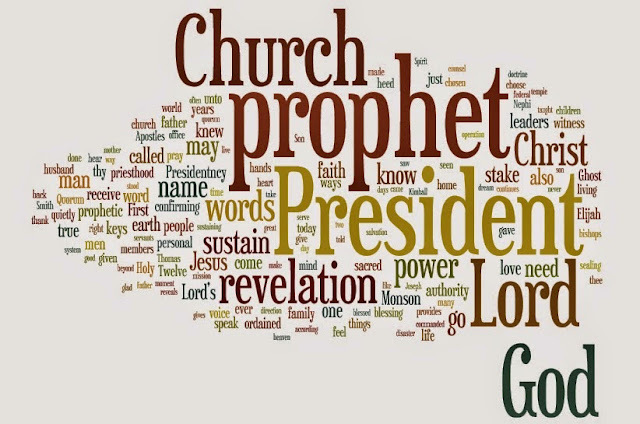 A number of speakers testified in October conference that Thomas S. Monson is a prophet, and not merely the president. I think your question is mis-worded, as BKP is one who does NOT ever call Monson a prophet. But many other speakers do. In our Dec 31, 2017 Sunday school, the teacher, wife of our stake pres, stated that Mr. Monson told Mr. Eyring of the impending 2008 stock market crash. This communication supposedly occurred in the temple, around a water cooler, during a break from discussions with the remaining twelve. Does anyone out there reading this have any corroborating evidence for this "prophecy"? Or is this just another unfounded member teaching to be tossed into the, eh, "faith promoting" lying-for-the-Lord dustbin? ?